President Obama no longer carries a BlackBerry. Odds are, you don't either. But don't start playing "Taps" for BlackBerry just yet. The company's future is no longer in hardware. It's in software and connected cars. And that future is giving the company and its long-suffering shareholders some hope that a turnaround is in the offing. BlackBerry (BBRY) stock rose 3% in early trading Tuesday after the company reported its latest quarterly results. BlackBerry posted a surprise profit, after excluding certain charges. BlackBerry boosted its profit outlook as well. But the stock gave up its gains by midday and was trading lower. The company is in the midst of a transition. It is shifting away from its iconic (and once ubiquitous) hardware in favor of software -- particularly for connected devices such as autonomous cars. Ford (F) is a big partner of BlackBerry, for example. It uses the company's QNX software in its cars to power its Sync 3 infotainment system. BlackBerry CEO John Chen said in the company's earnings release that the company is the "leader in mobile security" and that he expected growing demand for its software "as the number of mobile-connected devices continues to proliferate." He added that the company is on track to post sales growth of 30% in its software and services business in this fiscal year. Related: Obama was an innovation junkie. Will Trump follow in his footsteps? But BlackBerry has a long way to go before it comes even remotely close to the levels it traded at nearly a decade ago when the company was at the height of its popularity. The stock is down more than 15% this year and more than 95% below its all-time high from 2007. BlackBerry's old school cellphones with physical keyboards from the late 1990s and early 2000s were once so popular that people nicknamed them CrackBerries. The phones were popular with not just Obama either. They were fixtures on Wall Street because they had a great reputation for security. Celebrities, most notably Kim Kardashian West, were big fans too. But the company was notoriously late to the touchscreen smartphone game. BlackBerry's sales plunged and it started to rack up huge losses as customers left if for Apple's (AAPL) iPhone and the litany of devices running on Google's (GOOGL) Android mobile operating system. And BlackBerry announced in September that it has decided to stop making its own devices. It will rely on partners to manufacture the phones, which will still have BlackBerry's look and feel. Earlier this year, BlackBerry announced a joint venture with an Indonesian telecom company that will start making BlackBerry devices for that market. 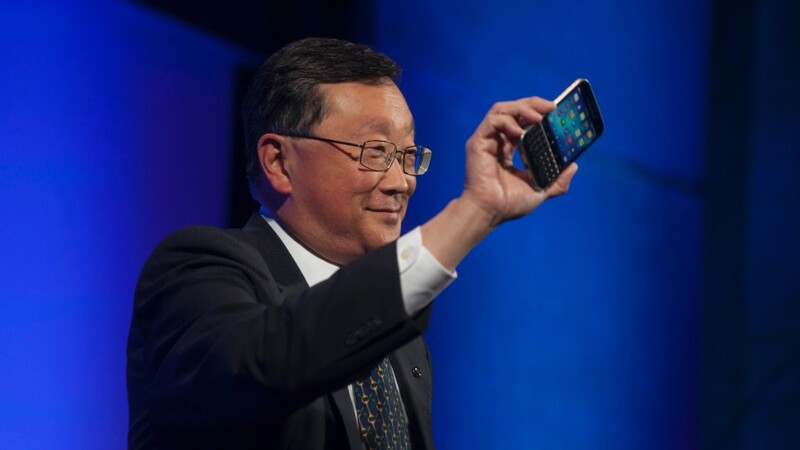 BlackBerry also recently disclosed that it had sold global BlackBerry branding rights to Chinese tech firm TCL. This is all part of Chen's turnaround strategy to try and save BlackBerry from fading into oblivion like other once-popular consumer brands such as Palm and Nokia. The company has made it this far despite takeover rumors and bankruptcy fears that have swirled pretty much ever since Chen took over the company in 2013. And Chen has saved a struggling company before -- he turned around software firm Sybase and sold it to SAP (SAP). Investors are still waiting to see if lightning strikes twice for Chen. But BlackBerry needs to show a lot more progress with this deal and more growth from its software business though. Despite the success in software, BlackBerry's overall sales in the quarter still plunged nearly 50% from a year ago. BlackBerry is still burning through its cash at a pretty quick rate, which is a concern too. BlackBerry had $1.6 billion in cash and investments on its balance sheet at the end of November, down from nearly $2.5 billion as of the end of its previous quarter in August. It is worth noting though that BlackBerry used $700 million in the most recent quarter to pay down debt. So that's the biggest reason why its cash level fell. It also refinanced its debt to a much lower rate. That is clearly a good sign for the company.